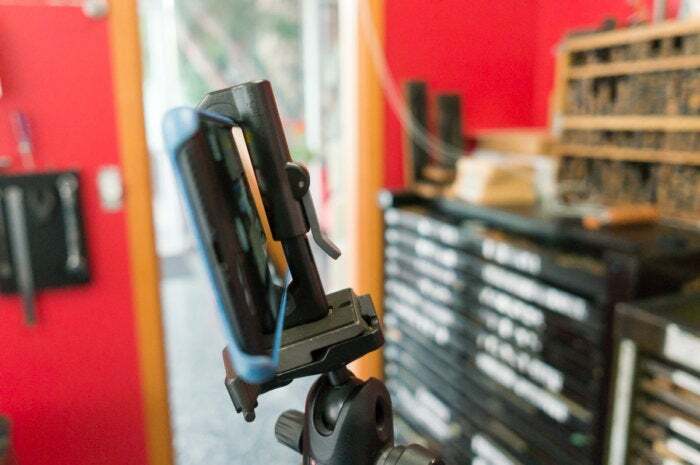 Studio Neat's latest tripod adapter, Glif, fits all phones (even non-Apple ones) in an attractive and well-made new design that uses a padded locking clamp and three mounting screw holes instead of one. This compact adapter is the perfect companion for a serious iPhone photographer looking for maximum flexibility, as well as a casual snapshotter who wants a better way to hold their camera, even without a tripod. I’ve used it on tripods and with the optional wooden handle. 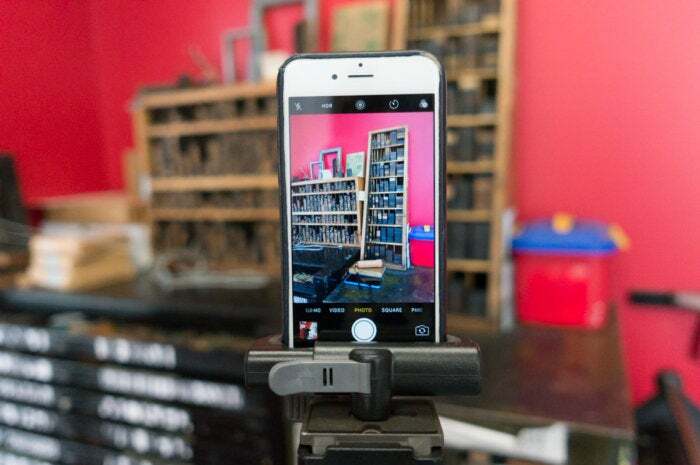 You can use the Glif in portrait or landscape mode through one of its three tripod mounts. 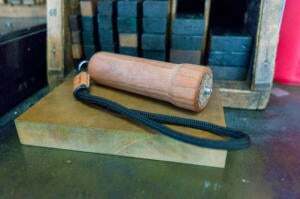 Gilf has a spring-loaded clamp with a smidgeon of soft rubber on the inside of the jaws, paired with an easy-release lever. I use two different iPhones, and it’s a matter of seconds to swap between them. You may sometimes shoot with or without a case, or loan the adapter to someone else to use. The locking handle snaps firmly into place in its second stage, also snugging the phone in closer. The quick-release lever has a well-thought-out nuance. It has a two-stage lock that lets you more easily work to get the right position. 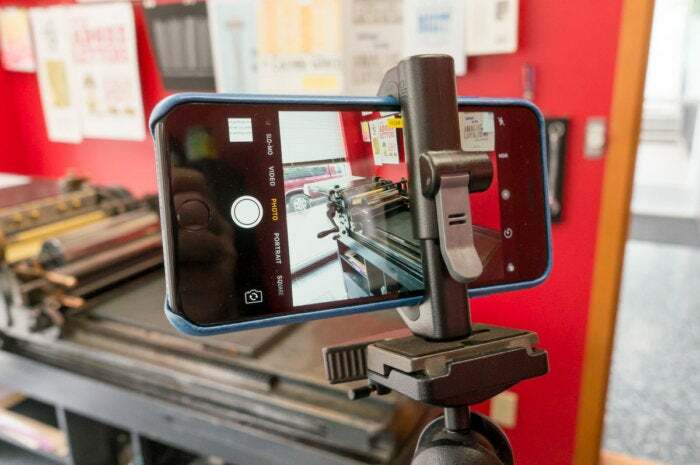 After adjusting or placing the clamp around your phone, sliding the lever into its first position tightens the clamp slightly and keeps the jaws from moving. However, you can still lightly open the lever again to readjust. Once you’re set for position, you push a bit harder to go into a second snapped-in lock, which again tightens slightly. This snapped-in position won’t slip and requires extra effort to unhitch. The three tripod mount points at first seem like overkill, as I don’t routinely carry extra gear. They let you mount an iPhone in either portrait and landscape orientations if that’s all you’re carrying. But if you’re a more serious photographer or videographer, who carries a mic, small lights, or a flash, you can mount those into the two remaining tripod holes. The Glif has an option handle with a cord. The basic Glif is $28 (available on Amazon). For $55, Studio Neat adds a cherry wood handle with a tripod screw on the end and a paracord wrist strap sewn closed at one end with a leather band (available on Amazon). I used this several times as a way to hoist an iPhone above a crowd to take pictures at events without getting my whole head in the way! But it also makes it comfortable to hold a camera for longer period of time while recording video or trying to get the perfect still shot. The optional handle makes it easier to take one-handed photos, especially with an agile finger. Handsome and affordable, the new Glif is a nice maturation of a product I’ve used for several years. It offers full advantage to iPhone photographers of working with whatever choice they want to make at any given time for how to shoot and what to use for stability or accessories. 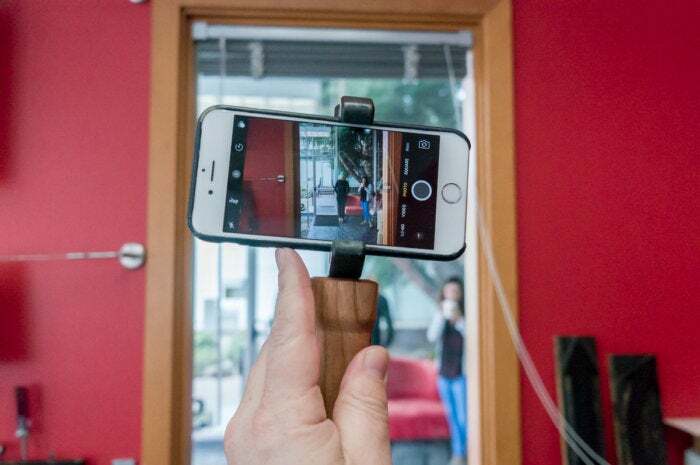 With an adjustable locking clamp and three tripod screw points, the Glif provides incredible flexibility for an smartphone photographer.